Behind the Glow | Is Egyptian Magic Worth The Hype? Oh Egyptian Magic. That weird jar you might have seen at your local Whole Foods or in an article about Kate Hudson’s biggest beauty secret. The packaging is...off-putting, to say the least. It looks like it came straight from the early 90’s because it did. 1991 to be exact. With primary red and blue color blocks, cheesy Egyptian iconography and an interesting description (plus a pretty substantial price tag of about $30), it’s not the type of product you’d think to add to cart immediately. And did I mention the CEO and founder is someone named LordPharaoh ImHotepAmonRa? According to his story, the formula for Egyptian Magic was revealed to him by a stranger one night in the 80’s (you can read more about that in this NY Times article). He started making it, trading then selling it in small natural grocery stores and soon word of mouth took it to another level. 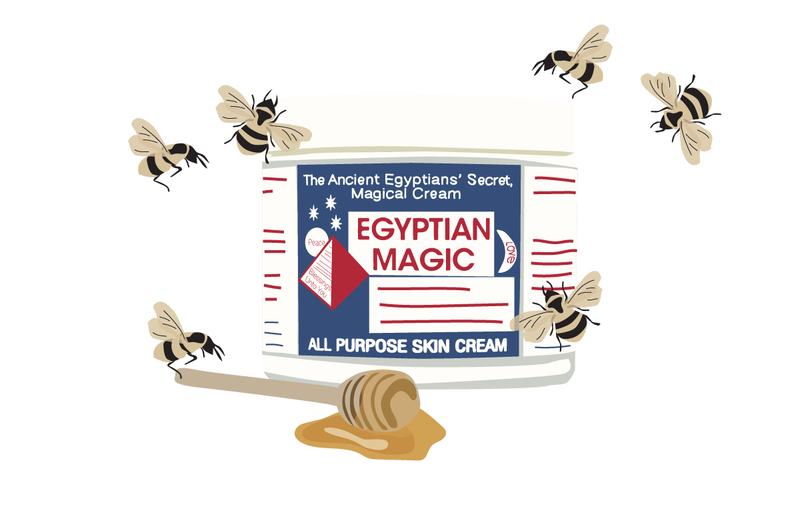 Now Egyptian Magic has gained, basically, a cult following from crunchy hippies to celebrities to beauty influencers. But does it actually work? Oh, yes. Why? Let’s look at the ingredients. There are only six with no added fragrances, chemicals or other nasties: olive oil, beeswax, honey, bee pollen, royal jelly and bee propolis. Each of these goods are highly moisturizing and soothing. Plus all of the bee products are antibacterial and naturally preserving so each jar lasts forever as long as you don’t contaminate it. I’ve been using it for years now and I’m a true devotee. I keep the larger tub at home and transferred some into a small container to carry around in my purse. Can’t. Live. Without. I currently have some weird irritation on my neck and under my eyes and this has been soothing it when nothing else has. So thanks, LordPharaoh. You’ve really made the world a more magical place. Need a jar for yourself? Snag one the next time you’re at Whole Foods or order one now.